What could be better than a great hero story? TWO great hero stories! And there’s no better place to find them than the Bible. Each Little Bible Heroes™ Flip-Over Book offers two stories of bravery, faithfulness, and kindness—straight from the Bible and perfect for little hero-loving hearts! 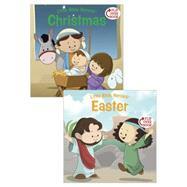 In these pages, read the amazing story of how Mary and Joseph obeyed God. Then flip the book over and learn how Jesus rose from the dead. Two great stories to learn from and enjoy!